I designed this set in early 2015. This is my first set that is double sided and I'm fairly happy with the results. I created 4 of each card, hoping to get 3 back from each athlete. This was a funny return. I sent Mr. Proehl the four customs, which he signed & returned in 48 days. I also sent a $10 donation. Mr. Proehl also sent me a photo that someone else had sent him for some reason, and also included that person's LOR and donation. I will forward that on to the other collector soon. Second attempt finally brought a return from Mr. Howley. He returned 4/4 customs in 12 days. A couple are a little smudged, but still a great return. Returned 3/4 customs (K1AO) in 28 days via his home. Got a return from one of my favorite players growing up. Doug Plank returned 3/4 customs (K1AO) in 12 days. 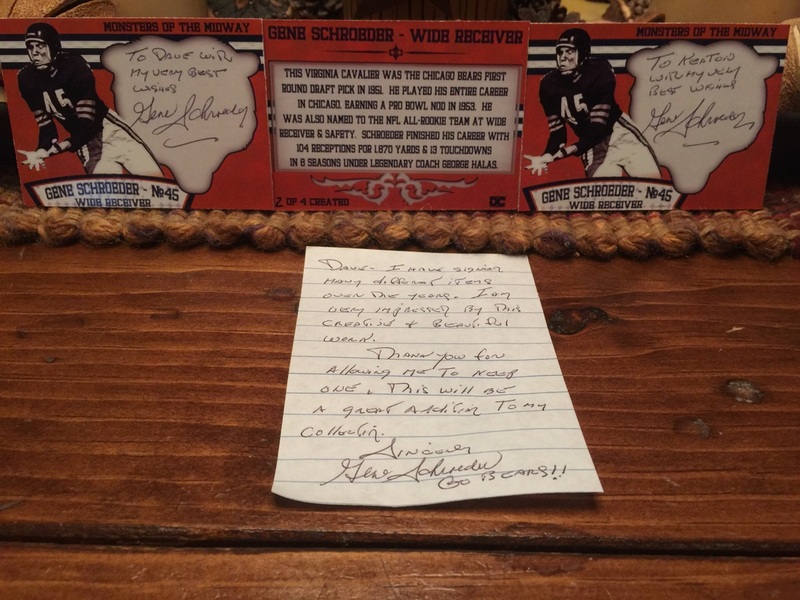 I was able to attend a signing at Dean's Dugout in Naperville, Illinois, on 10.26.2015 to secure Mr. Amos' signature. He signed one of my customs, I made 1 for him to keep as well. 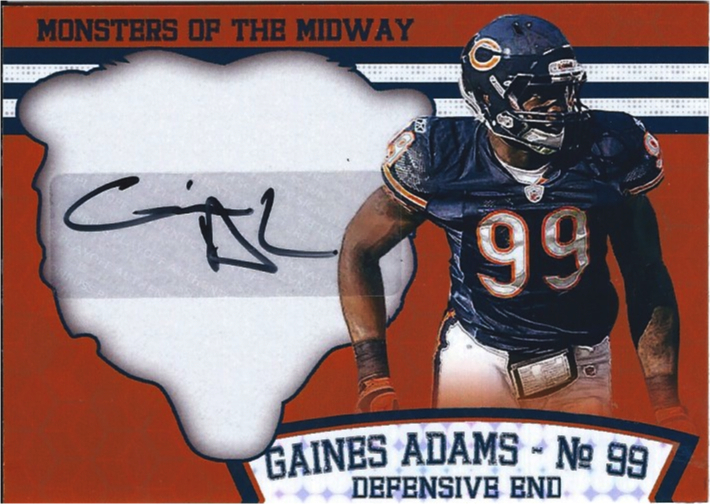 I picked up a Gaines Adams 2007 Playoff Memorabilia card at the Nationals this summer and sent it off to a friend on SportsCardForum.com to create this one of a kind card of Gaines Adams. Thank you, Patrick, for the help! Mr. Bratkowski returned 4/4 customs in 21 days. Took a few months, but was able to pick up Waymond Bryant for the set. Returned 3/4 customs in about 3 1/2 months. K1AO and personalized to me and my kids. One of my favorite players in recent memory, Mr. Mangum returned 3/4 customs (K1AO) in 15 days via his Mississippi home. A standout at TCU, Mr. Montgomery had a short career with the Bears in a backfield that featured some dudes named Sayers, Bull, & Piccolo. Returned 3/4 customs in 14 days (K1AO). The first success I've seen from him. Stoked he took the time. 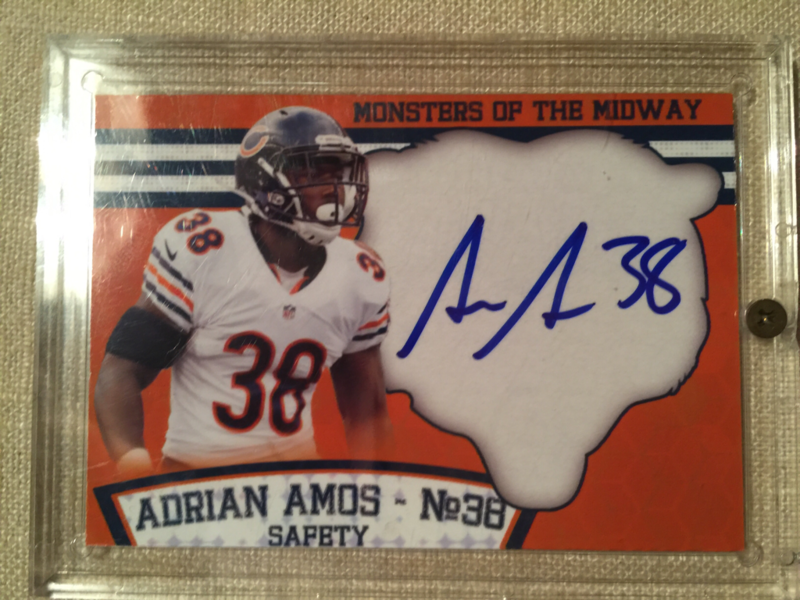 Super fast return from the Super Bowl Champ! Six days on the return... returned 3/4 personalized. Lightening fast return from Mr. McKie... 5 days door to door. Returned 3/4 customs. 187 days for this one to come home. 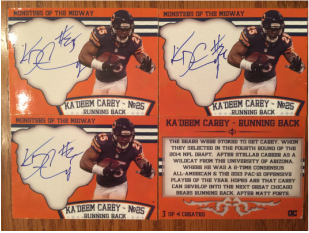 Mr. Carey returned 4/4 customs. 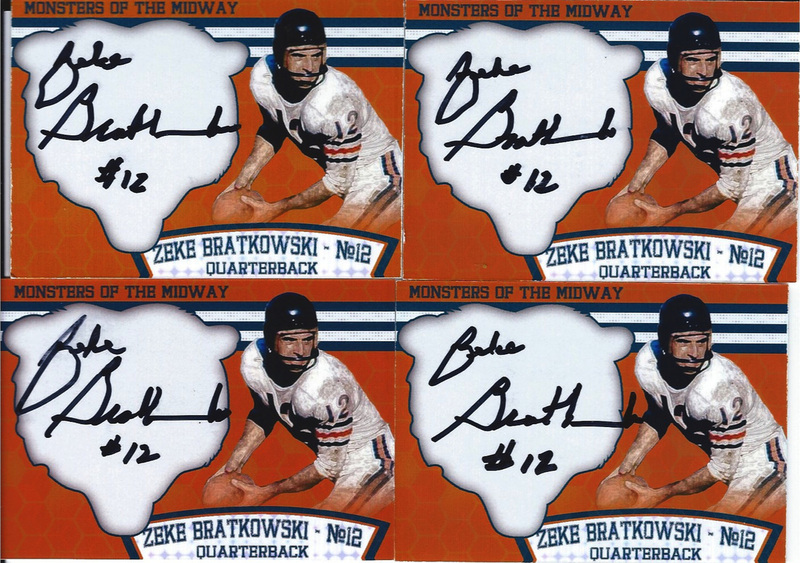 He's been one of the more consistent TTM signers off the Bears roster for the first two years of his career. ​Returned 3/4 customs (K1AO) in 28 days via his home. 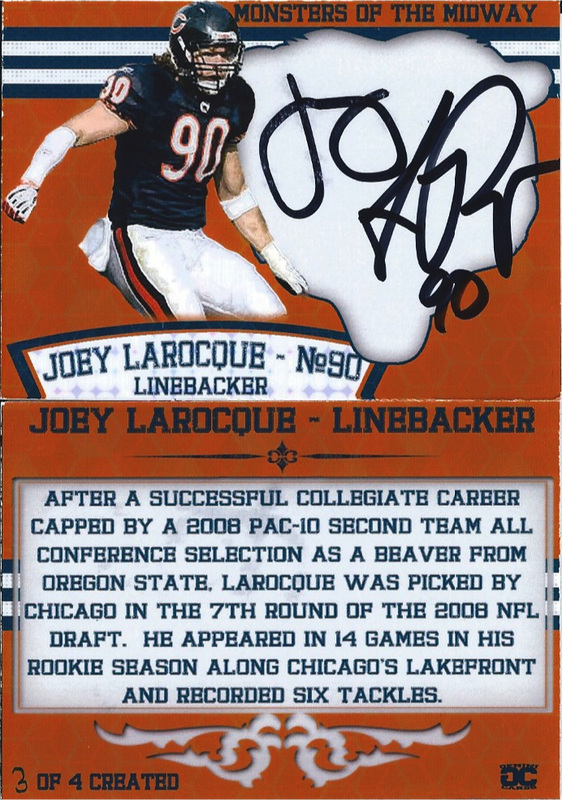 LaRocque played one season with the Bears and one with the Jets. He now owns a company which manufactures gear towards improving the safety of the game. He returned 4/4 customs ( I only show 2) and a nice note via his company in Texas. 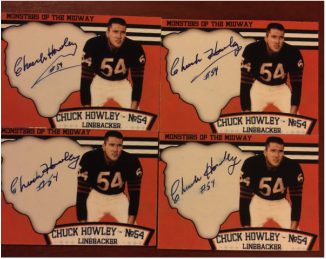 Got a great (and fast) return from Gene Schroeder who played with the Bears from 1951-1957. Returned 3/4 customs, K1AO, in 5 days via his home & sent a nice note... personalized cards to me and my kids. Mr. Williams responded in 43 days via his charitable foundation. I sent a $10 donation, he K1AO and returned 1 signed. As always, my man, Desmond Clark came through for me. Returned 3/4 customs in 21 days via his home. Gary Lyle had a great career in Chicago through the late 1960's and early 1970's. He returned 3/4 customs (K1AO) in 14 days via his home. 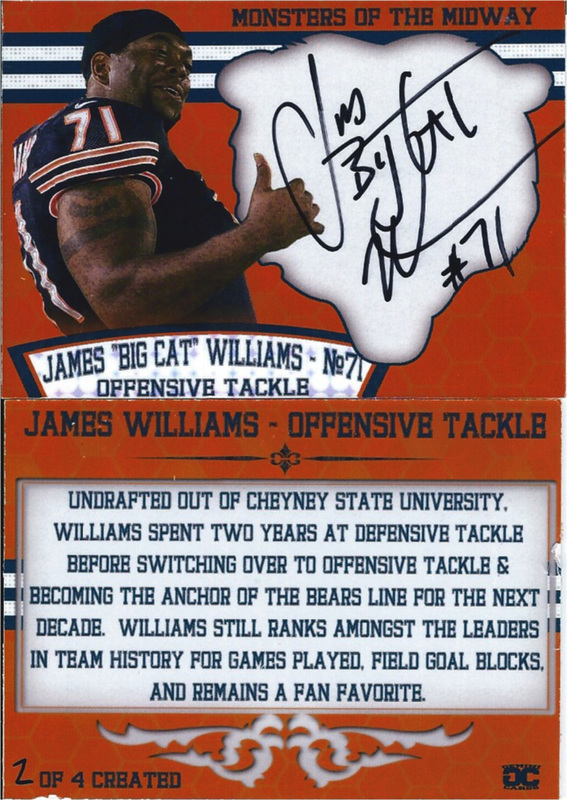 One of the best current signers of the Bears alumni, Spice returned 3/4 in 7 days... told me he loved the design on the envelope.